“Breaking News!” We hear it so often that the phrase can lose its meaning. While taking part in a training exercise with LA County Fire, I was reminded of what it means to those who must respond to bring order out of chaos, perhaps even saving lives. In the studio at LA 36, a public access channel in Santa Fe Springs. 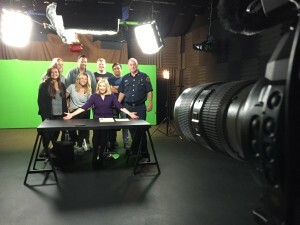 I played the role of news anchor in a training video produced by the LA County Fire Dept. 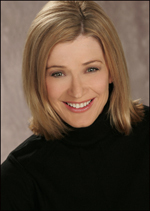 with the assistance of the production company Picture Business. There was no script. I was given a scenario of a developing story in West Hollywood and asked to ad lib, tossing to one reporter in a helicopter and another on the ground. No spoilers here: Let’s just say it involved assault weapons, a mysterious duffle bag, a nearby fire, at least one hostage, surveillance and cellphone videos, evacuations and lockdowns. The edited video will eventually be part of an exercise for first responders and local officials who must quickly respond to news developments. Recent attacks in Orlando and San Bernardino have once again demonstrated the importance of preparation and decisive action when seconds count. 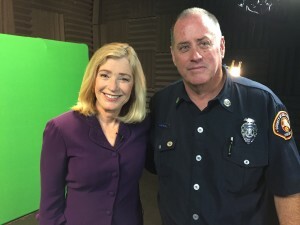 Captain Ted Mendenhall, a firefighter who also went to film school. Just as in coverage of a “real” breaking news event, everything depends on teamwork. 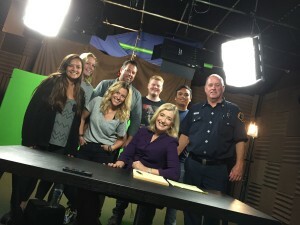 The studio crew was led by LACFD Captain Ted Mendenhall and producer Sean Roldan, who share a background in film school. This thoroughly professional crew reminded me of why I have always loved telling a developing story from the anchor desk. Special thanks to PA Sarah Mendenhall, who also happens to be a talented makeup artist! 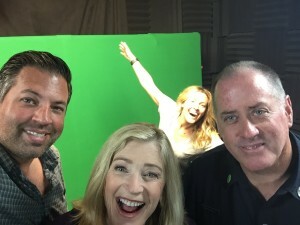 Selfie photobombed by our makeup artist! This opportunity came about because of one of my former students, Karen Zarsadiaz-Ige, a former broadcaster who now does PR for LACFD. This exercise was an example of how coaching can pay off for both the journalists who raise the questions and the authorities who must answer them. I am so proud to have played a small part in it. It was a pleasure to work with this talented team.